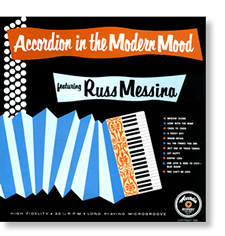 Russ Messina displays his musical skills and creative Jazz compositions on "Accordion In The Modern Mood". This album is a great example of early Jazz Accordion (recorded in 1958). Messina mixes Swing, Big Band & a touch of Bebop throughout his arrangments & improvisations. Messina is joined by Frank Primerano, on Bass, and Sandy Graff on drums. This album is a must have for anyone that likes Jazz or Accordion music. I´ve heard them all. Without a doubt, Russ Messina was the greatest jazz accordionist ever. Though the album is fifty years old, the music is timeless. Each song on this album is a high quality mp3. You will need a mp3 player like itunes or Windows Media Player to listen to it.You can also load this album on to portable mp3 players like the ipod or microsoft zune. Download links are emailed to you fast. Pay through paypal and check your email. Sometimes the download link will go into the spam box so check for it there also. The album is about 50mb and should only take about 5 mins to download with a broadband internet connection. If you are dial up it will take a lot longer. © 2008 Accordia Records All rights reserved.